Nekarat swipes at a hero. Nekarat the Keywarden is a Unique boss added in Patch v1.0.5. This monster can be found somewhere in the Gardens of Hope 2nd Tier, an area in Act Four (and, prior to Patch 2.2, in the Silver Spire Level 1). On Inferno difficulty Nekarat has a chance to drop the Infernal Machine crafting plan that teaches the Blacksmith to create the Portal Device, an essential component of the Infernal Machine end game event. Unlike the other three Keywardens, Nekarat does not need to be farmed, since each player only needs to find the Infernal Machine plan once, to teach it to their Blacksmith permanently. However, if you do farm him he will randomly drop one of the three keys. 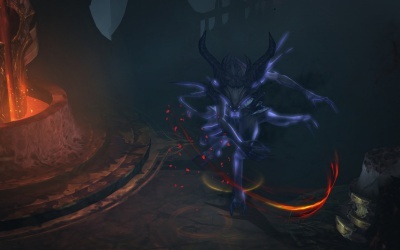 Nekerat is a challenging enemy who is especially difficulty for melee fighters. Besides his basic swiping claw attack and good foot speed he has the Jailer ability to stop fleeing enemies. His most dangerous attack is a melee range fire field that swirls out from him on the ground. This deals huge damage to anything in range and is powerful enough to one-shot most players if they are not using a powerful defensive ability when the attack comes. The best strategy for defeating him is to stay out of reach and pelt him with ranged attacks. 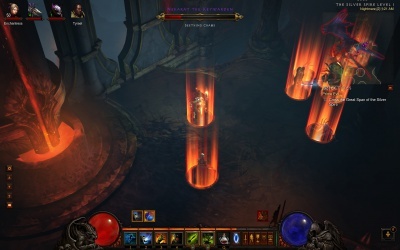 Even that may not be safe, since Nekerat has high hit points and good movement speed and he will stay doggedly in pursuit of a Demon Hunter or Wizard no matter what sort of escape or movement skills they use to attempt to avoid him. The ancient texts describe the Terror Demons as unconquerable foes, the dreams of Diablo made flesh. They appear in shadow to torment their victims, and then... in shadow they vanish. The mere sight of one drove a Horadrim to madness, leaving him screaming and clawing at his eyes until the end of his days. Nekarat uses his Jailer talent. Take the three demonic organs to Haedrig and craft them into a Hellfire Ring. Two videos of Nekarat encounters. A Witch Doctor dies in a tough battle. Another Witch Doctor scores the Plan. This page was last edited on 8 April 2015, at 11:58.